There's nothing quite like the HomeCook'n Newsletter...with those funny jokes, great recipes, helpful cooking tips, and interesting reader comments. Now you can import the content from each issue of 2016 into Cook'n! We compiled each issue of the newsletter into a cookbook that you can import into Cook'n and keep forever! Jest for Fun: A FUN and Healthy Weekend! Jest for Fun: Dog Wants a Kitty! Jest for Fun: Great Scott, Marty! Jest for Fun: Great Workout Motivation! Jest for Fun: Just Give It To Him! Jest for Fun: The New Chatbook Ad! Jest for Fun: What Baby? Jest for Fun: What is your Celebrity Chef Name? Jest for Fun: Words and Phrases Remind Us of the Way We Word! Kitchen Pantry: A Little Waffle Please! Kitchen Pantry: Eat Mor Chikin! 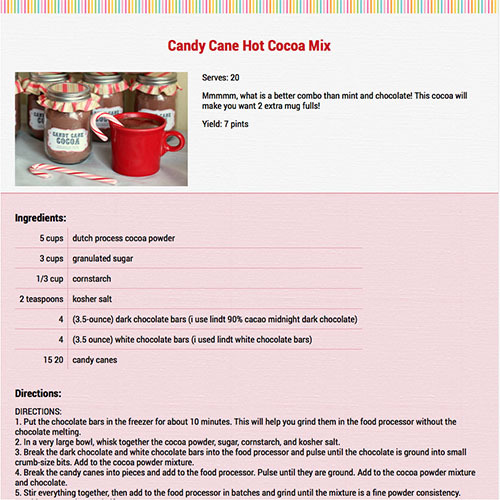 Kitchen Pantry: How To Sync Your Pinterest Recipes with Cook'n! Kitchen Remedy: Avocados for Breakfast! Kitchen Remedy: Breakfast Really is the Most Important Meal of the Day! Kitchen Remedy: Chocolate Pie Without Milk! Kitchen Remedy: Does Your Family Live to Eat?! Kitchen Remedy: Freezers are Our Friends! Kitchen Remedy: Go Ahead and Indulge! Kitchen Remedy: Is Online Grocery Shopping Right for You? Kitchen Remedy: Making Do with What We Have: Luscious Lemon Cake! Kitchen Remedy: Meat is not the Only Source of Protein! Kitchen Remedy: Soup, Salad, and Breadsticks-Gluten Free! Kitchen Remedy: Trump Taco Salad Bowls? Kitchen Remedy: Which Lettuce is Best? Kitchen Remedy: Who Stole the Cookie? Refrigerator Door: Best (and Easiest!) Rice in the World! Refrigerator Door: But I Want a Cookie! Refrigerator Door: Healthy Breakfast in a Hurry! Refrigerator Door: Keeping Avocados Green! Refrigerator Door: Keeping Brown Sugar Soft and Sweet! Refrigerator Door: Make Ahead Snacks to Boost Your Energy! Refrigerator Door: Making Your Home Smell Fresh! Refrigerator Door: Open a Jar the Easy Way! Refrigerator Door: Pizza Sauce in a Pinch! Refrigerator Door: Stuffing a Ziploc Bag! Refrigerator Door: You Can Have Your Smoothie and EAT It Too! Table Talk: Bore No More! Table Talk: Camping Out with Food, Family, and Fun! Table Talk: Cooking for two Instead of a Crowd! Table Talk: Dessert Pasta? !...Yes Please! Table Talk: Did You Know? Table Talk: Eat Your Bowl! Table Talk: Happy Healthy Holidays! Table Talk: Hot Dogs, American or Not? Table Talk: I Love Fall! Table Talk: Luck of the Irish to You! Table Talk: Oui to the Baguette! Table Talk: Pizza! Pizza! Breadsticks! Table Talk: The Power of Perseverance! Table Talk: The Top 8 Things about the Holiday Season! Table Talk: What is Your Kitchen Aloha? Table Talk: What the Pho?! Table Talk: Who Popped the Corn? Table Talk: You Don't Eat No Meat? !